I will be making a tutorial for people who want to learn how to design a logo. 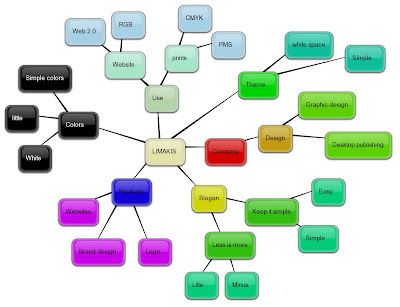 This will be the first step on every design, that is making a mindmap. A mindmap? you might say. A mindmap is a sheet where you write down specific information in a diagram that you need to get a idea where to start. I will show you how I will be making a logo in few steps. I will be making a logo for a non existing company. After searching for a good name I though of a name of a slogan. The name for the company is Limakis Design, and Limakis stand short for Less is more and keep it simple. I searched around if there are companies that have this name, and found there is non. So what do we need, to make a mindmap. Actually you just need a pen and a sheet of paper, but there are software that makes life easier. Like Microsoft Visio that can make a diagrams, but recently I found a free online program that is totally free. That program is called Bubbl.us you can visit this link http://www.bubbl.us to use this program. It is a very straight forward and easy to use, and I use it in this tutorial. So lets start brainstorming and go to http://www.bubbl.us and press the start button. I won't be explaining how bubbl will work because it got a own help menu that explains everything. The first word we will write down and the center of it all will be Limakis, because it is the main subject. The main subject is always in the middle so you always remember what it is all about. From this word on you will start to make child balloons to start on the diagram. But first we need to ask ourself or the company few question to determine allot of stuff so you know what the company does en represent and what they really want. These are few questions we need to ask to determine allot of things. - What kind of company is it? - What do they sell or produce? - What is there motto or slogan? - What theme of feeling do they want? - For what are they going to use it? From these question we will write down the answers and then search for words that got something to do with them and connect them all together. Of course if you got different question and got problem you need to figure out you can write them down as well. Also write down things you need to do or need to keep with, as you could use this as a reminder list. And just write down the words with a logical connection to all of these. And here is the mindmap for Limakis. Of course this could be bigger and more words but this is in of for you all to know how to make a mindmap. To make its even more easier to understand and for yourself to make this less boring, you could add picture to the mindmap. From this mindmap we can determine the logo need to be simple and not buzy with little things. And use little colors with allot white space.